Bohemian Crystal is an exhibition of glass sculpture by internationally acclaimed Czech Republic artists Vlastimil Beránek, Jaroslav Prošek and Michaela Smrček. The Czech republic has a very long tradition of making the finest crystal and quite rightly stands today as an international leader. Globally recognised for its high quality craftsmanship, beauty and innovative design. Bohemia boasts numerous internationally renowned glass studios and art schools who use techniques and manufacture steeped in the centuries old tradition, while still honouring ancient Bohemian art and its cultural heritage. 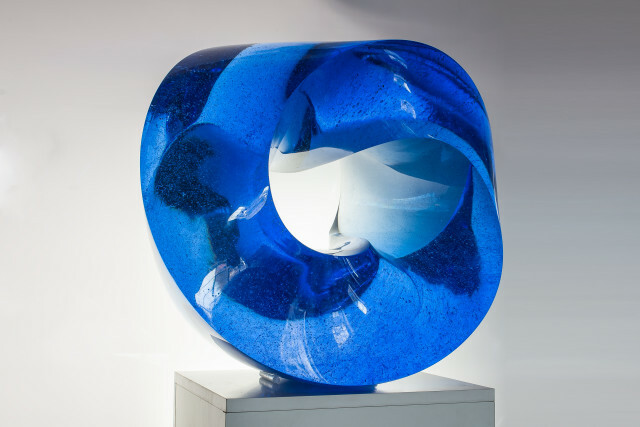 Vlastimil Beránekworks with molten glass to create large, undulating sculptures that command the attention of any space in which they are installed. The extreme size of his works pushes the limit of glass sculpting technology and he has earned the accolade of creating the world’s largest sculpture from a single piece of glass. Jaroslav Prošek’screation of complex structures from a variety of different materials has put him at the forefront of the contemporary art and design scene in both the Czech Republic and internationally. Michaela Smrček glass sculptures are inspired by nature and are unique works created by melting glass into moulds. More recently her sculptures have reflected her relationship and opinions within contemporary society: life, relationships, attitudes, religion and a universal approach to humanity.